Cherry Hinton Road was originally called Long Drift (map of 1810). In this year the original track was laid probably as a result of a very straight plough line. The road was however not properly made up until 1895. Below the point of the The Rock Hotel the ground became marshy in what is now the Perne Road area. Cherry Hinton Road had drainage ditches that ran into the main drainage ditch parallel with Perne Road. Erica Dimock writing in the Cambridge news in 1964 suggested that the road was the scene of battles between the English and Danes. She mentioned evidence in the early 19th century of fields in the locality of saffron. The evidence of the UK census returns is that that development occurred at quite a different rate at either end of the road. At the eastern end, near the Robin Hood Inn, there existed back in 1841 and 1851 inhabitants who were part of the rural community that was Cherry Hinton. Along what was then known as the Cambridge Road we see a community where the householders were farmers and agricultural labourers. John Okes the wealthy surgeon had recently built Cherry Hinton Hall, but there were few other homes in the very near vicinity. Ventress farm can be identified as can the horticultural operations of the Coe family. Many of the women were laundresses and probably self employed; a very few continued the ancient practise of lime burning. The Waterworks were built in 1852 but it is not until the 1871 census that we can see resident employment associated with the Waterworks to the west of the Coe family landholding. There are those jobs associated with the running of the steam engine at the site and the odd bricklayer has appeared in the vicinity of Laundry Lane. In the 1881 census we see evidence of the first substantial new houses designed for the middle classes near the present day junction with Mowbray Road, then just the route of the stream. A bank clerk, a music teacher, a manufacturer and an academic show that a new suburb of Cambridge is in the making. By 1891 the number of these middle class households has doubled; meanwhile the Steam Laundry, built in 1883 adjacent to the Waterworks has its own cottages and has attracted both men and women to settle there. In many cases it is the women who are the laundry employees whilst the men have other occupations. Meanwhile at the western end of Cherry Hinton road, there is little evidence of a community at the beginning of the 19th century. Even the 1881 census lists only three families in this stretch of the road and it is not clear exactly where they lived. A groom, an agricultural labourer – they were still part of the rural economy but now there appeared Edward Baldock, railway signalman, a sign of things to come. 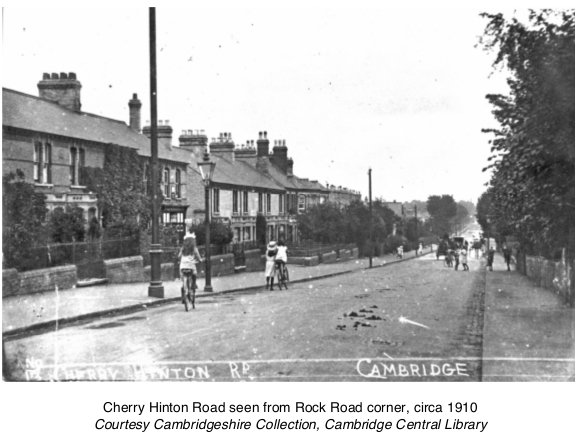 Just as in the area half way along the road to the east, still called the Cambridge Road, substantial middle class family homes went up in the 1880s. We find by 1891 a retired grocer, a chaplain, a builder, tailor and solicitor. These are all built on the south side of the road between Hartington Grove and Rock Road. Opposite on the north side appear rows of humbler cottages housing a school mistress, a stone carver, a railway clerk, cooks two, carpenters four, grocer, piano tuner, gardeners two and a dairy. By 1901 the cottages on the north side stretch not quite as far as Cowper Road. By 1911 the cottages now extend on both sides of the road almost down to the modern line of Mowbray Road. In June 1953 the Cherry Hinton Road District Coronation sports and tea was held. The sports were held on the Coleridge Road Recreation Ground and the children all had tea afterwards at the Free Church Hall.